TrustVeterans.com - A Veteran's Take: A busy weekend. Well it was a very busy weekend and is already shaping up to be a bit of a crazy week for our company and our Veteran outreach efforts. At Security America, we always attempt to provide the best possible service, at the most affordable prices and that's not just ad lingo. It's a business ethic. Which is something new to a "fresh off the boat" Veteran like me. Business ethics compared to "core values" while on active duty. The two seem to go hand in hand to me, but not to everyone I meet. Some of the mortgage lenders who claim to help Veterans, actually do not. I will never name drop out of professional courtesy, but when it takes 3 months or more for a Veteran to close a VA loan, something is wrong. Let me present an example of what I have seen recently... a current client of ours was turned down by a "big bank" due to his insistence on utilizing his VA home loan. When we finally were able to speak with him, we discovered that he was fully qualified to utilize his VA loan, but the bank wanted to push him and his family into another product. Why would a bank do this you ask? Profit margins. An FHA loan might be easier for another mortgage lender to do because that may be where their expertise lies. But when a lender speaks with a client and is unwilling to do the legwork necessary to save them money by taking advantage of their VA loan benefit, that is a serious failure in my book. Everyone in America wants to make money. Everyone has a family and personal priorities. But a conscious decision is made when one chooses to engage in unscrupulous business practices (predatory lenders anyone?) to make a profit. We enjoy transparency. It helps to keep everyone, on both sides of the table, honest. And when two parties can engage one another on a level playing field in America, both can benefit and become prosperous. I am eager to continue serving the Veterans in the City of Houston, and this weekend is a big celebration for our community, Veterans Day. Veterans Day is a celebration of those who served in our nations armed forces, and is not to be confused with Memorial Day, which honors our fallen armed forces members specifically. 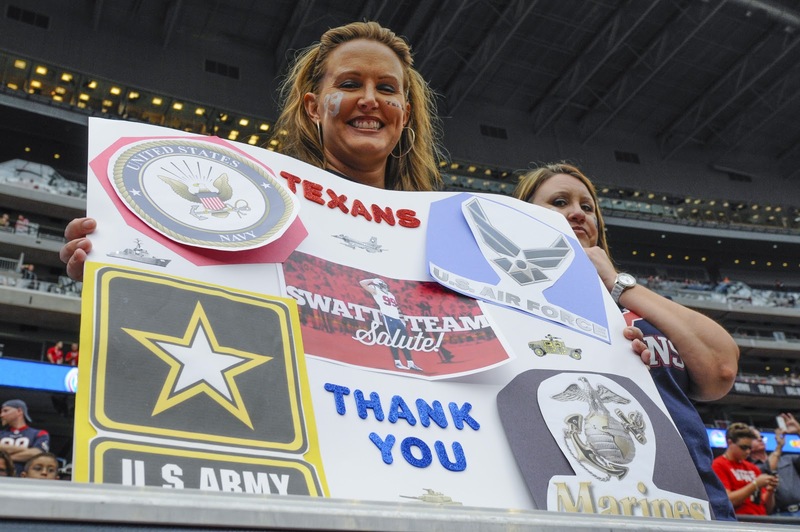 Coinciding with the week long festivities spread throughout the city of Houston, was the Houston Texans Salute to Service football game, where the hometown Texans took on the Buffalo Bills for a large crowd of uniformed service members and retired or separated Veterans. This was a unique opportunity for Veterans and active duty military members alike to participate in festivities surrounding the game. There were Bar-b-q cook offs, music by local Houston performers, autograph opportunities with the players, a sneak peak into a Texans practice and the game on Sunday where the Texans put the hurt on the Bills.